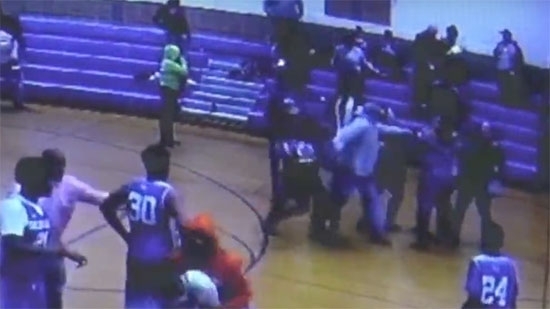 Five women and a teenage boy have been charged following a brawl in the stands of an 8th grade basketball game in Salem County last weekend. It happened shortly before 9 p.m. Saturday 1/19 at Pennsville Middle School. The game was part of the Salem County Rural League between visiting Salem and Pennsville. Towards the end of the game parents of opposing teams started arguing and then fighting broke out. The incident was caught on surveillance video in the gym. 22-year-old Asis Martin of Salem, 20-year-old Kamya Kibler of Salem, and 18-year-old Ta'kyah Dow of Salem were charged with simple assault and disorderly conduct. 34-year-old Wanda Rivera of Pennsville, 52-year-old Wanda Rios of Pennsville, and the 13-year-old boy of Salem were charged with disorderly conduct. No one was seriously injured. The death of a man found frozen in a pool in New Hope, Bucks County, has been ruled accidental. The body of 29-year-old Jose Quiroz Marcial of Lambertville, NJ, was discovered in an uncovered frozen swimming pool behind the Mansion Inn on South Main Street by a construction worker on site at the adjacent Logan Inn on Tuesday, 1/22. The Bucks County District Attorney's Office announced that death was the result of an accidental drowning and hypothermia, per the autopsy results. Marcial worked at several area restaurants. He was last seen on December 15th. The Chester County District Attorney's Office announced the results of an aggressive drug operation called "Operation Wildfire." The over two-month operation resulted in the arrest of 77 alleged heroin and opioid dealers in the county. District Attorney Tom Hogan says they confiscated around 7,000 doses, most laced with fentanyl, which would cause 100s of overdoses. He said that the dealers themselves were mostly individual actors in business for themselves. They were all ages and races, men and women. Most are charged with drug and gun trafficking, but some are also charged with distributing drugs that resulted in death.